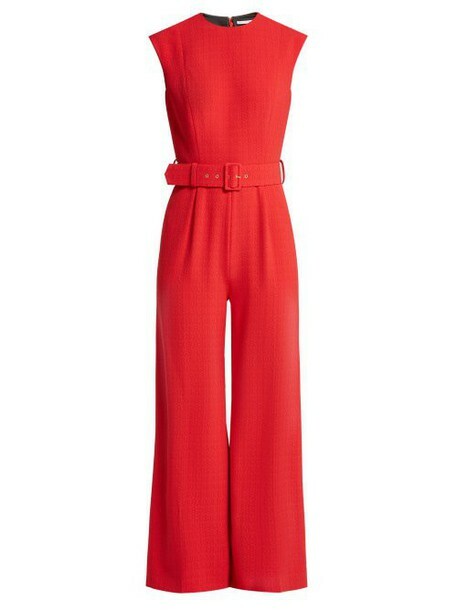 Emilia Wickstead - Emilia Wickstead's red waffle-weave cloqué Barbara jumpsuit is a head-turning alternative to a gown for evening events - a style that is exclusive to MATCHESFASHION.COM. It's shaped with a slim-fitting, panelled bodice and cropped cap sleeves and is defined at the waist with a coordinating, buckle-fastening belt. Style it with velvet mules and statement earrings as part of a monochromatic look.